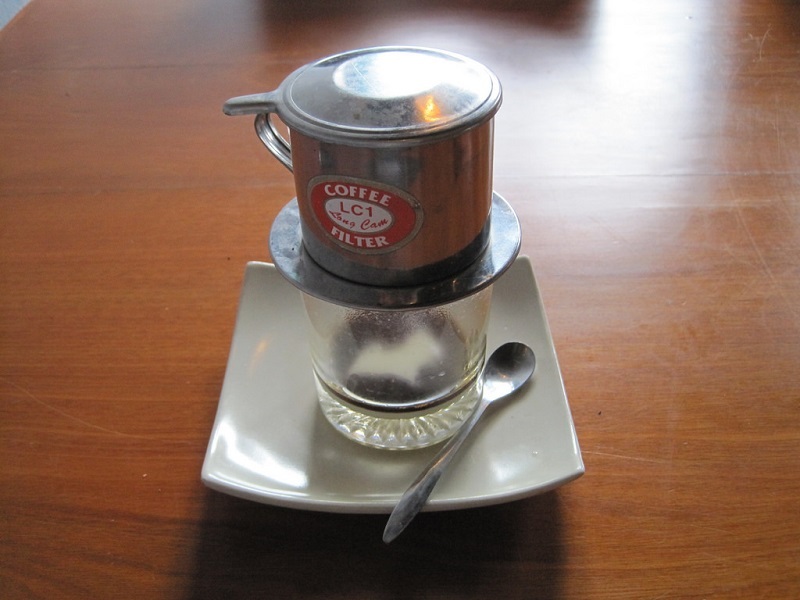 Home > Vietnamese culture > Vietnamese Coffee Will Change Your Life! Here's why. Vietnamese Coffee Will Change Your Life! Here's why. Hear the words ‘world’s best coffee’ and it’s likely you think of an espresso in a tiny cup, downed in one gulp by a George Clooney-esque gent at a coffee counter in Italy. Or maybe you picture hessian bags filled with the finest roasted beans lugged over the shoulder of a shirtless Colombian farmer. Or perhaps you imagine bespectacled penny farthing aficionados downing double-shot soy lattes in a Melbourne café, as they twirl their moustaches and discuss inner-city rooftop beehives. Point is, it’s unlikely Hanoi, capital of Vietnam, springs to mind. But it was in Hanoi, on a recent trip, that I guzzled some of the best coffee I’ve had in years. It wasn’t my usual café latte either. In the sticky heat of the Vietnam summer, I imbibed café sua da, aka a Vietnamese iced coffee, at any and every opportunity. Coarsely ground beans are loaded into a drip filter, which ever-so-slowly spits out super-strong coffee, one drop at a time, into the waiting cup below (good things take time, right?). 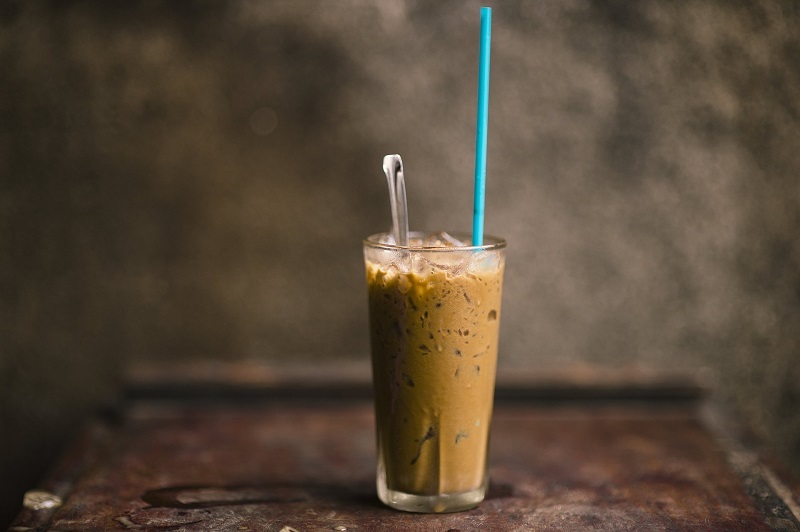 Add some ice cubes and a couple of tablespoons of sweetened condensed milk and you’ve got a very delicious, very caffeinated chilled cup of joe. But there’s more to Hanoi than the refreshing icy brew. Much, much more. On my final afternoon in Vietnam, after I’d strolled around Hoan Kiem Lake forlornly wondering how I was going to get through my days breakfasting on muesli rather than pho and sitting on a chair rather than a tiny stool when I returned home, I remembered there was still one coffee left to try, and one café in which to try it. Giang Café, situated in a blink-and-you’ll-miss-it alley in Hanoi, has been serving up its specialty brew for over 70 years (albeit in different parts of the city). But what is it that has tourists shunning more ‘comfortable’ coffee establishments and locals giving said tourists the hairy eyeball when they can’t get a table at the narrow two-storey café? Ca phe trung. Egg coffee. After zig-zagging through the streets of the Old Quarter, my coffee-drinking accomplice and I stand on the footpath looking up at the sign, checking the blue dot on the map on our phones, peering down the alley – this has got to the be the place, right? 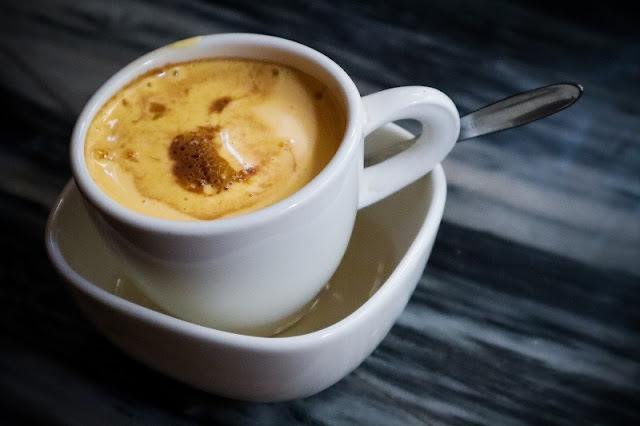 So famous is Giang that several rival cafes have opened their own similarly named coffee houses, or emblazoned their street-front blackboards with ‘Original egg coffee served here!’ or ‘Best egg coffee in Hanoi!!!’. But based on the stream of people going in and out of the narrow passage, we’re certain we’re in the right place. A surly man behind a cash register glares at us when we arrive; a blender whizzes noisily in the small kitchen behind him. “Table for two?” we gesture. He waves us up the staircase nonchalantly, with a flick of his wrist. The small upstairs area is rammed. Low tables, surrounded by even lower stools, are crowded with all sorts: men in business suits, their jackets folded carefully over briefcases and shirtsleeves rolled to the elbows; fresh-faced backpackers flicking through dog-eared travel tomes; one young couple who, we’re sure, met the night before and are continuing their holiday romance over a cup of the city’s famous beverage. We settle ourselves at a table in the corner, order two iced egg coffees, and wait. Due to the scarcity of fresh milk in Vietnam (because of a lack of cows and difficulty in keeping milk cool in the pre-refrigeration days), coffee drinkers had to get creative. A whisked egg here, a dollop of condensed milk there, the occasional knob of butter and cheese, have all been credited with the ca phe truong’s deliciousness. And delicious it is. A young waiter, deftly balancing a tray of 15 or so drinks, ambles through the crowd of eager faces, finally arriving at our table. “Ca phe truong,” he announces, placing the two beverages in front of us before disappearing down the stairs. We peer into our glasses, like a pair of archaeologists at an excavation site. One third is taken up by a layer of caramel-coloured coffee, followed by a smattering of ice cubes, pressed close against the glass. Then, the piece de resistance: the whipped egg concoction. Perfected in 1946 by Nyugen Giang (the inventor of the drink and founder of the café, which is now run by his son), the custard-like mixture is made up of egg yolks, coffee powder, condensed milk, butter and cheese (although exact quantities are a closely guarded secret). We stir it all together, clink together our glasses, and take a sip. Of course, it’s to die for; more of a dessert than a thirst-quenching pick-me-up. As we drink, we hypothesise about the couple sitting across the room. When did they meet? It must have been last night. Where are they from? Bratislava and Iceland, obviously. Do they even share a common language? Who needs words when you’re in love? The waiter moves around the room, delivering iced and hot coffees (served in a mug, sitting in a small bowl of hot water, to keep the drink at just the right temperature) as patrons come and go. After scraping the last of the coffee-eggy-deliciousness from our glasses with a spoon, we hoist our backpacks on and head down the stairs and out onto the busy Hanoi street. Bikes, hundreds of them, zoom by, as bicycles laden with helium balloons, rice cookers and market-fresh flowers slowly wheel by. This city never stops. Must be all the caffeine.